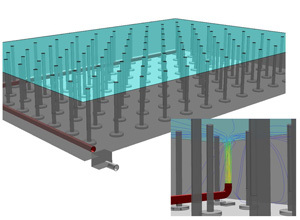 CFD modeling of reservoirs is where fluid dynamics meets applied statistics. 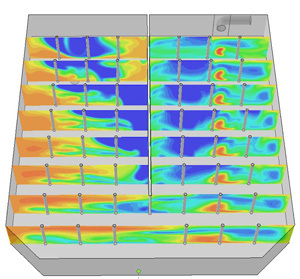 Because of the temporal nature of reservoir flows and the need for keeping track of tracers, using CFD to evaluate a reservoir’s behaviour is a cost effective option. Steady state flow model: A time independent or steady state model is run first to establish the flow patterns throughout the model. The assumption being made here is that once the flows entering and exiting the volume have been doing so at approximately the same rate for some days, the established flow patterns in the reservoir are constant. 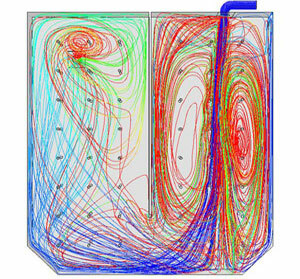 Flow and turbulence data from the steady state model are used as a continuum for the time dependent models. Time dependent discrete particle model: A temporal analysis of the reservoir can be performed by releasing neutrally buoyant particles from the inflow and tracing their trajectories through the model to the outlet. Upon release into the reservoir, the particles disperse and follow the flow patterns established by the steady state model. When each particle is captured at the model outlet, the time elapsed between release and capture is recorded, thus providing a statistical database for the reservoir. Time dependent species model: Another temporal evaluation of the reservoir is performed by introducing a tracer species at the inlet. Like the particle model, the species model uses the flow field from the steady state solution as a continuum. At time zero, a tracer is introduced at the inlet, then at specified time intervals, the concentration of the tracer is recorded throughout the reservoir. Graphic output from the time dependent species model is used for qualitative analysis in the form of contour plots of tracer concentration. 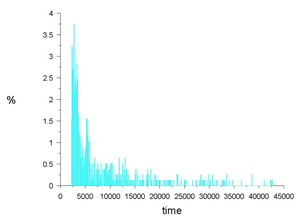 More advanced reservoir models can have time varying inflows. Also, large vessels or basins with average residence times extending into days or weeks may have varying thermodynamic input from sun and wind that induce convective flow patterns.